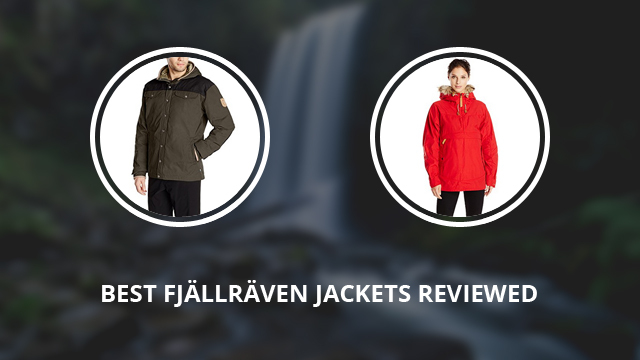 In this brand review, it is time to look at Fjällräven, a Swedish brand that was founded in 1960, by Åke Nordin, in Örnsköldsvik. It started as an innovative brand for hiking and camping backpacks, which then moved on to become one of the most popular manufacturers of outdoor gear. Their products now do not simply include quality backpacks and traveling bags, but a vast collection of clothing (tops, trousers, jackets and accessories) and outdoor gear, such as tents and sleeping bags. It is a popular brand online that now has its name renowned in many parts of the world. For our selection, we chose ten of their best jackets for cool weather. Whether you prefer a light jacket, or are one of those people that feel the cold even in Summer, you are sure to find what you are looking for within these options. We have chosen five men’s jackets and five for women, so let’s get right into it. The one beginning this selection is Raven, a blend jacket, designed for the warmer months. It is made of 65% G-1000 recycled Polyester and 35% Cotton, so it is water-resistant, lightweight and breathable. Besides that, it is also eco-friendly. The design resembles a casual shirt, which makes Raven a pretty good daily jacket for casual wear. It has four oversized flap pockets on the outside, two on the chest and two on the sides. Besides the two side pockets, there are also slanted pockets underneath them, for the hands. There is also an inner pocket with a zipper closure. It closes to the front with the main zipper, which is water-resistant and has a snap-button placket covering it. The collar is short, stand up, with an attached hood behind that can be tucked underneath it, when not in use. This jacket comes in seven different colors: Black, Navy, Green, Lake blue, Sand, Mountain grey and Uncle blue. 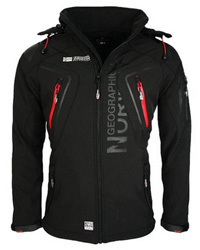 The second jacket is designed for climbers and it is called Greenland No. 1. 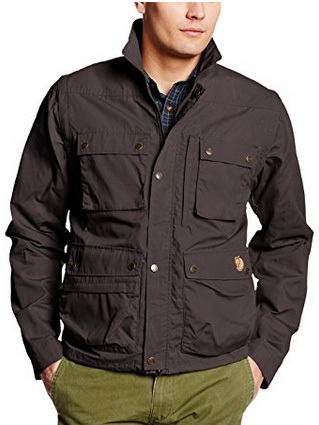 This jacket is also made of 65% Polyester and 35% Cotton. Unlike the previous one, it comes with down filling. The outer shell can be wax-coated, to give it extra insulation and weather-resistance, however, as it is, this jacket is water repellent and windproof. It has a high, hooded collar and has double layered sleeve cuffs for extra protection. There are two side pockets and two chest pockets, these ones with flap closures. 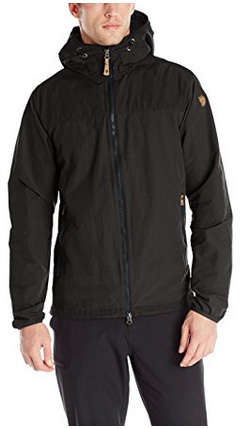 The main zipper is water-resistant and protected by a snap-button placket. The color selection includes the colors: Black, Mountain grey, Burnt red, Deep red, Sand, Tarmac, Taupe, UN blue, Uncle blue, Olive, Grey and varying shades in between. Abisko Hybrid is a mild-temperature jacket, suitable for Spring and Autumn, mostly. The material is 65% Polyester and 35% Cotton, with a water-resistant membrane, which is breathable and windproof. It is simple in design, without too many logos and with just two zipper pockets on the sides. The collar is high and slightly oversized, with an attached hood, that is adjustable with drawstrings in the front. On the inside there are two mesh pockets for your essentials and in the bottom hem, there are two drawstrings. With these drawstrings, the jacket can be fully fitted around the body, to prevent heat-loss, as well as dampness or wind from getting through. The main zipper comes with a long toggle and it is uncovered. The cuffs are elastic and the jacket comes in seven colors: Campfire yellow, Dark grey, Pine green, Sand, Tarmac, Lake blue, Uncle blue. Next we have Skogso, a trendy and casual jacket that easily adapts to your daily life, whether it is being active outdoors or just going out for meeting your friends. It is made of 60% Polyester and 40% Cotton, that make up the G-1000 Lite fabric for the body. On the shoulders there is the G-1000 Classic, for reinforcement. All this makes the jacket water resistant and windproof. The collar is hooded and adjustable, to fit tightly around the head and insulate the jacket, as well. There are two side pockets and two vertical pockets on the chest, all four with zipper closures. The cuffs have snap-button fasteners, as does the placket covering the main zipper. In the hem, there are drawstrings for adjustment and it is cut in a high-low design. Around the waist there are also adjusting drawstrings. It comes in the colors: Black, Dark grey, Dark navy, Dark olive, Deep red, Green, Sand and UN blue. The fifth and last jacket for the men’s selection is Reporter Lite, casual in style, but excellent in performance. The material is 65% Polyester G-1000 Lite and 35% Cotton. 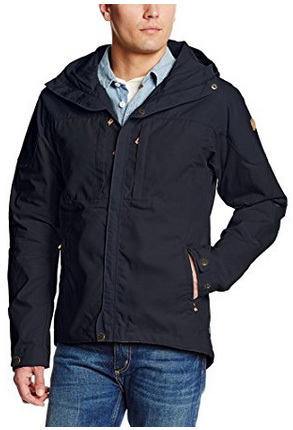 It is a weather-resistant jacket, with a feature that sets it apart from the rest of the selection. The sleeves are removable and this jacket transforms into a Summer jacket, perfect for traveling and spending time outdoors. There are four oversized pockets on the outside, two on the chest and two on the sides, as well as several on the insides. All these pockets provide plenty of storage space, leaving your hands free. The main zipper is two-way and water-resistant, covered by a placket that fastens with snap buttons. The color options include: Dark olive, Green, Light khaki, Ochre, Dark grey and Sand. 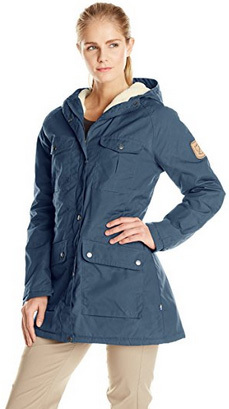 Time to take a look at the women’s selection and Iceland Anorak is the first on the list. 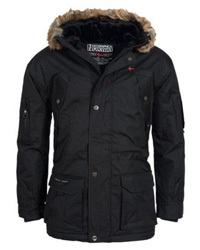 This is a beautiful winter coat, made of 65% Polyester and 35% Cotton, with G-1000 Original fabric. The outer shell can be treated with wax to further weatherproof it. There are two oversized pockets on the sides and one kangaroo pocket above them. It opens with side zippers, but there is also a front zipper, which goes mid-way from chest to collar. Speaking of which, it is hooded, with an oversized and adjustable hood that has faux fur trim around. The cuffs are adjustable with Velcro fasteners and there are drawstrings in the bottom hem, as well as around the waist. This jacket comes in the colors: Navy, Red, Sand and Dark garnet. Close in design with the men’s version, Skogso for women makes for a great running and overall outdoors jacket. This, due to its light weight and high breathability. The material is 65% Polyester and 35% Cotton on the inside, while the outer shell is 88% Nylon and 12% Elastane, making it a lot more flexible and comfortable to wear. The collar is hooded and adjustable, closing in the front with the main zipper. 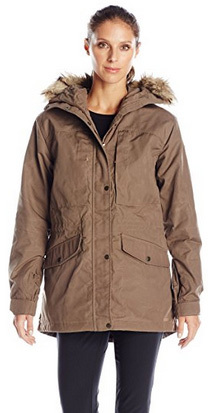 The main zipper is water-resistant and covered by a snap-button placket. There are two outer pockets on this jacket and it comes with snap-button fasteners on the cuffs. On the inside can be found two mesh pockets, one on each side, big enough to provide more than sufficient storage space. The bottom hem is adjustable and the jacket comes in the colors: Black, Dark olive, Glacier green, Sand, Dark navy and several other shades. Next in line is Fjallraven’s Greenland, a light parka that is made of 65% Polyester and 35% Cotton. 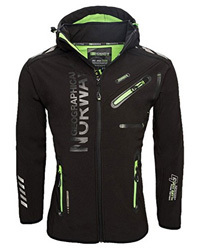 It is a water-resistant, windproof and breathable jacket, suitable for cool Spring nights and late Autumn. The outer coat can be also treated with wax for improved resistance against the elements. There are four oversized pockets on the outside, two hand-warming pockets and it has two pockets on the inside as well. The inside is also lined with soft and fluffy fleece for added warmth. The collar is hooded and also lined with fleece. It comes with a full-way zipper, covered by a snap-button placket. There are many colors to choose from: Uncle blue, Black, Dark navy, Green, Ochre, Taupe, Red, Burnt red, Copper green and Mountain grey, with an additional shade of Copper green. Moving on to Sarek, this oversized jacket comes with faux fur on the hood, which is attached to the high collar. The fabric is part of the G-1000 Original collection and it is made of 65% Polyester and 35% Cotton. There are two large flap pockets on the sides and two vertical chest pockets. It comes with inner pockets as well, suitable for small electronics. The cuffs on the sleeves can be fastened with Velcro and both the waist and hem are adjustable with drawstrings. It has a covered main zipper, which is water-resistant. The outer part can be waxed, if you live in unstable weather or if it rains frequently. The color selection includes: Autumn leaf, Dark grey, Dark navy, Dark olive, Sand and Taupe. 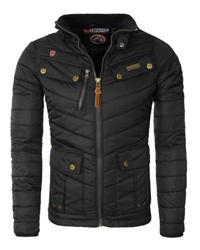 Lastly, this chic padded jacket is called Keb Loft and it is made of 65% Polyester and 35% Cotton. The padding is G-Loft Supreme, a high-performance material that provides complete insulation and manages to maintain most of its qualities even in case it gets wet. 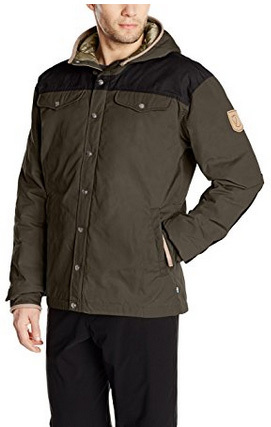 This jacket has elastic cuffs and a short, stand-up collar. The main zipper is covered and two-way, as well as water-resistant. The jacket itself is water-repellent, meaning that water slides off of it and can’t get through. As with most padded jackets, Keb is also quilted, in a horizontal pattern, to properly distribute the padding. 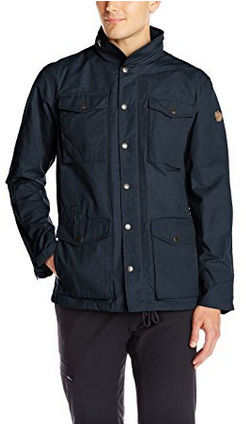 Despite being thin and lightweight, it performs effortlessly and makes for a great Spring and Autumn jacket. The color options available are: Black, Red, Tarmac, Avocado and Ox red. Previous Article← Why is Arc’teryx so Expensive? Are Their Jackets Worth the Price?